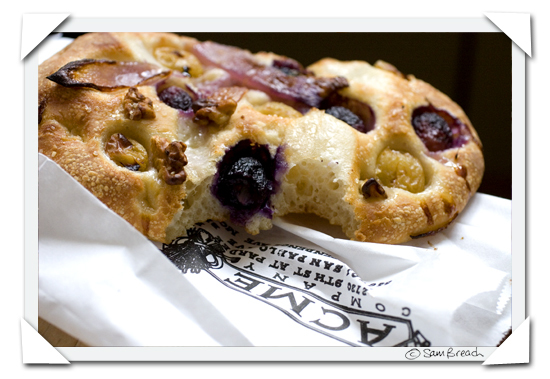 This is the ACME bread version of a traditional flatbread made in Tuscany during the wine grape harvest. According to ACME, who I think must have taken their information from this website, it is such a classic it can be seen pictured on the frescoes in Etruscan tombs and the name is derived from the schiacciare which means 'flattened' or 'crushed'. Acme's rendition of this seasonal offering made a very special and unique lunch for me today. I loved the dough which was crisp on the outside but billowy and soft within, it was chewy and crunchy all at the same time. Big fat juicy green and purple grapes were joined on the surface by soft caramelised onion, toasted walnuts and a dusting of Turbinado sugar. I can't begin to tell you how unexpectedly delicious it was and how perfectly all the components complimented each other. It tasted so good, it put me off my bombolini. The bad news? This harvest special is only available for three days and the last day is tomorrow, Sunday 28th October. What's more - they are only offering it at lunchtimes - what can I say? Perhaps you need to take a trip to the Ferry building, at lunchtime tomorrow. Whilst you are in the Ferry Building, head to Boriana's anyway, because they have just taken 50% off the price of their chestnut flour due to a sell-by-date at the end of October. Very convenient if you are planning to make a chestnut cake tomorrow - it's just $3.25 for a 500g bag at the time of writing. Wow that really is an interesting bread! I have been a chef for over 10 years and havn't come accross it before! It seems very similar to foccacia in style! Keep up the good work and keep bringing us the interesting insights into food! Sam that looks so very delicious. Really easy to make, too. Done it a couple of times this year. Just make your favorite bread dough roll two very thin sheets of it, stick lots of grapes on top of the first, sugar and some oil, put the second sheet on top , cover again in grapes, sugar and oil. The rest of the stuff ACME added is optional. Had a really good example of this in September while we were in Tuscany, just outside Florence. The biggest challenge is to find the right bread dough for it. I really do like bread that crisps up on the outside, but doesn't rise or puff up so much. The second biggest challenge is finding the right grapes - in Florence it is wine grapes, much smaller, juicier, and with seeds. Well, OK, the seeds I can do without, but the taste of grape is much stronger.